Going to a brick and mortar record store is giving way to downloading music. Making a purchase with physical cash or credit cards is giving way to paying directly with your mobile phone. 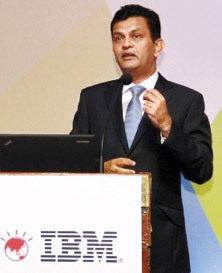 Chrishan Fernando, Country General Manager, IBM Sri Lanka. The speed with which consumers are buying products and services is dramatically shifting in today's digital era, and businesses who fail to respond quickly enough to keep pace with the evolving consumer are the ones who will be left behind in this new era of computing. With the changing economics of IT, companies now are able to embrace transformative technologies to drive growth without losing sight of day to day needs. So, how do companies stay on top of meeting their business goals while keeping an eye on what is coming around the corner - or even risk innovating to stay ahead of the curve? Confronted with this growing complexity, organizations are finding it nearly impossible to be successful when executing entirely on their own, making partnering and collaboration core strategies that can provide the edge many organizations need to tackle the toughest forms of innovation. Furthermore, CEOs are establishing more open and collaborative cultures - those in which employees connect more with each other and the outside world not only to innovate, but also to reinvent themselves. Learning from each other, they stay ahead of the skills curve, remain open to change, and become in effect "future-proof." In the era of Big Data, what's different now is how much consumers are telling marketers by leaving behind a trail of "digital breadcrumbs." In turn, marketers are sifting through that enormous flood of data to paint a vivid picture of each person as an individual. A recent survey of 20 leading retail brands on Facebook measured responsiveness to customer questions, comments and complaints. With more than 900 million people using the social networking site, the survey illuminated a more salient reality - word now travels far more quickly than at any time in history. To effectively engage an individual consumer, client or citizen, organizations must weave together insights about the whole person - from sources they likely haven't consulted in the past. They will need stronger analytic insight to uncover trends and answer questions they never thought to ask. In essence, they now must listen to their clients in new ways. And it's social media that is providing a virtual testing ground for how well companies are delivering on their promises. Marketers must turn their companies into social businesses if they have any hope of establishing a long term relationship with customers. Business and government leaders are asking for help in dealing with the radical digital changes beyond products and services. They are embracing technology in completely new ways to spot oncoming threats, capture immediate and unexpected business opportunities, and address business challenges with a more simplified approach. Technology has been and always will be the invisible thread that knits an organization together. It is transforming the ability to innovate, allowing companies to test new ideas at a pace unimaginable even a decade ago. However, the pressures of delivering results at an accelerated pace now requires a new level of computing to turn a strategic vision into a business reality. Successful companies are asking questions like, "How is technology changing the game in my industry? How is it changing the nature of the way my products and services are delivered to consumers? How are we using new kinds of information to bring a new level of engagement with the consumer?" The philosophy of seizing opportunities presented by new technologies, rather than fearing or merely keeping pace with them, needs to be integrated into the DNA of every company's business marketing, sales and product design strategies to keep their companies viable and successful for the next generation and beyond. As market dynamics and technological advances continue to force more organizational change, significantly impacting how businesses engage with customers and employees, CEOs will continue to look to technology not only to make them more efficient, but also to enable increased collaboration and create relationships - essential connections to fuel creativity and innovation.